State of Iowa, 15.05.1872, 7 % Third Mortgage Bond über US-$ 1.000, #312, 23,2 x 27,2 cm, blau, schwarz, Knickfalten, kleinere Einrisse und Randschäden mit Archivband repariert, sonst VF, vier Vignetten: Dampflokomotive im Bahnhof oben in der Mitte, links Pferdegespann beim Pflügen, rechts Father Marquette und Louis Joliet beim Erkunden des Mississippi, unten US-Wappentier, kompletter Kuponbogen, imprinted revenue (RN-W2) in der Mitte, nicht bei Castenholz gelistet, nur dieses eine Exemplar ist bei Cox gelistet, US-Railroad-Bond der Superlative aus der Sammlung Tankred Menzel! 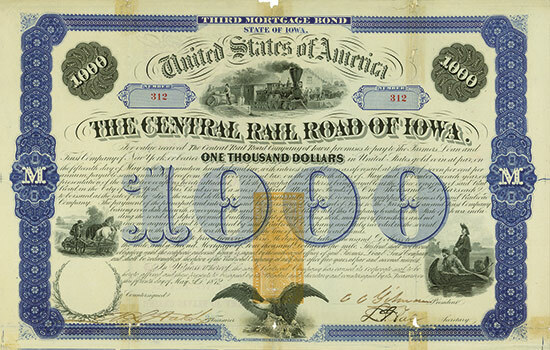 State of Iowa, 15 May 1872, 7 % Third Mortgage Bond for US-$ 1,000, #312, 23.2 x 27.2 cm, blue, black, folds, small tears and small edge damages, repaired with archival tape, otherwise VF, four vignettes: steam locomotive at station, farmer plows (left), Father Marquette and Louis Joliet exploring the Mississippi (right), eagle below, complete coupon sheet, imprinted revenue (RN-W2) in centre, not listed in Castenholz, the only certificate listed at Cox, Premium Railroad Bond from the collection of Tankred Menzel! Die Eisenbahngesellschaft wurde 1869 gegründet. Sie betrieb die 189 Meilen lange Strecke von Albia nach Northwood (Iowa). Sie war eine Anschlussbahn der St. Louis, Kansas City & Northern Rail Road. 1873 wurde die Bahn zur Central Iowa Railway Company reorganisiert. The company was founded in 1869. It operated the 189 miles of railway track between Albia and Northwood (Iowa). It was a connecting railway of the St. Louis, Kansas City & Northern Rail Road. The company was reorganized to the Central Iowa Railway Company in 1873.